A gritty Western adapted by Tommy Lee Jones from Glendon Swarthout's novel, The Homesman puts a refreshing feminist spin on this most ancient of genres. 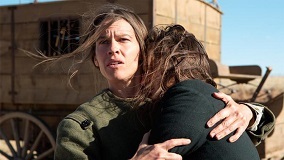 Hilary Swank stars as Mary Bee Cuddy, a go-getting pioneer woman eking a tough existence on the plains of 19th century America. When Mary hears of three insane women, each driven mad by the harsh realities of frontier life, she takes sympathy and vows to transport them east to Iowa for treatment. But in order to do so, she needs to enlist the help of grizzled claim jumper George Briggs (Jones), who she saved from the hangman's noose. The film has drawn much acclaim for Swank's performance, the evocative cinematography by Rodrigo Prieto and the script's intelligent handling of gender relationships. Another key character in the film is the atmospheric score by Marco Beltrami, who contributed an eccentric, quirky, Morricone-esque soundtrack for Jones' directorial debut The Three Burials of Melquiades Estrada back in 2005. Clearly the famously prickly Jones enjoyed the experience of working with Beltrami, as he has allowed this fine composer to indulge his creative side once again for his second directorial outing. 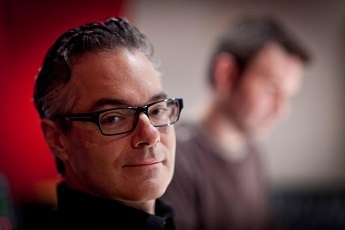 Although a composer primarily associated with the horror and action genres, as the likes of Scream and Terminator: Rise of the Machines attest, Beltrami has shown an affinity for Western conventions throughout his work. Whether it's the occasional amusing homage for Deputy Dewey in the Scream movies or the full-blown pastiche of the Oscar-nominated 3:10 to Yuma, this is a composer with an obvious love of the genre (“I think I approach all my movies as if they are Westerns”, Beltrami recently admitted to Huffington Post). He is therefore the ideal person to score a movie such as The Homesman. Add in the presence of Jones, clearly a filmmaker unafraid of indulging a creative soundscape, and one has the ideal recipe for an authentic, innovative, modern day Western soundtrack. The results don't disappoint. The score is anchored by the theme for Mary herself, first introduced in the "Main Title". Beginning with some wistful piano chords, recalling the sounds of a honky-tonk saloon as filtered through a distant memory, the theme then develops into a beautifully evocative lament for solo violin, followed by strings and guitars. It's at once period-specific and yet also emotionally resonant for a contemporary audience, speaking of the harsh American landscape and also the spirit of the people who had to establish themselves within it. The theme pervades the score and is more often than not a joy when it appears, but a great deal of the music is also given over to Beltrami's avant-garde side. One of Beltrami's much-publicised aims was to capture the essence of the wind, a perennial character in the drama as it blows ceaselessly across the vast American plains. To this end, he fashioned a quite unusual and fascinating instrument, consisting of a piano attached by strings to a huge water tank which, when played outside, allowed the composer to essentially 'harness' and tune the sound of the wind. It's an effective textural device, allowing the listener to feel the grit between their teeth in tracks such as "On the Plains" and "New Born" that deliberately aim for a sterile, arid sound. Although the orchestral elements are present in tracks such as these, they're intentionally robbed of their humanity and vigour in order to musically represent the brutal realities of life in the Wild West. "Picking Up Arrabella Sours" continues in the same vein, the heartbreaking violin eventually taken over by the desolate piano. The off-kilter strings and strumming banjo in "Sod Buster" are uncomfortable and disturbing, calling to mind Morricone's more experimental Western material. However, it's not all doom and gloom: one of the score's great strengths is the way it balances the appealing and challenging material, as the following track "Bathtime" demonstrates with its gentle, nostalgic interaction between piano, guitar and violin. Rattling percussion, castanets and wailing strings in "Pawnee" soon draw the score back in a more unsettling direction, the acoustic mix again favouring a sense of coldness. Things become even more eerie in "Bury Doll", a track in which the distant piano appears to be subsumed beneath the ever-present wind effects. Clanging percussive devices are used sparingly, a sense of human mechanisation being pitted against the unforgiving landscape. "River Crossing", "Travel Montage" and "It's Abandoned" restore the sense of melody with gorgeous, flowing renditions of Mary's theme whilst "Leaving Home Flashback" once more robs the piano of its warmth, wistful yet evoking the sense of a painful memory. "Are You Crazy" is marked out by the hazy strings, through which the piano comes drifting like the equivalent of a tumbleweed. "Cuddy Lost" initiates a dark passage of tracks, also encompassing "Where's Cuddy?" and "I'll Be Back Directly", in which the strings drone and buzz like a hive of angry insects. The mournful piano solo in "Cuddy Lost" adds a brief sense of melancholy but by and large the mood is one of desolation, marked out by the occasional input of a handmade slide guitar fashioned by Beltrami's right hand man Buck Sanders. Clacking castanets, sparingly used percussion and tinkling piano create a sense of unease before Beltrami restores a sense of melody during the soundtrack's conclusive stages. "Entering Town" mixes the piano (now appealingly graceful) with a lilting guitar solo, gradually building more strength through the expansive string section. The guitar is even more prominent in "Briggs Moves On", working brilliantly with the banjo and violin to craft a classic Western sound before "Onto the Ferry" and "The Homesman End Credits" end things on a satisfying note with moving, expressive variations on Mary's theme to remind us that this is the tale of the Old West as seen through a woman's eyes. The sense of flowing melody in the latter track is especially lovely, a reminder of Beltrami's skill in writing hauntingly attractive themes. The aptly named, conclusive "Wind Haiku" is largely an experiment in sound design, reminding us of Beltrami's fascination with capturing the sound of the wind. The Western is one of Hollywood's oldest genres, dating back to the birth of cinema. Consequently, the history of the Western soundtrack is just as old, having been through innumerable permutations throughout its lifetime, most famously via the rousingly adventurous sound of Elmer Bernstein and the operatic stylings of Ennio Morricone, the latter of course famously taking the sound of the genre in a whole new direction. So what fresh innovations are left? 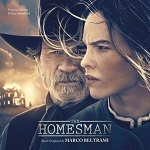 It's fallen to Marco Beltrami who, in the course of three scores (Melquiades Estrada, 3:10 to Yuma and now The Homesman), has injected new life into the sound of this frequently moribund genre, one that's said to have been on its last legs numerous times over the last 20 years. Beltrami impressively fuses his own penchant for experimentation (no doubt gleaned from his mentor, the great Jerry Goldsmith) with a tender sense of beauty to depict both the harshness and appeal of the Wild West, conjuring something that is both pastiche and wholly original. For these reasons, The Homesman is undoubtedly one of the finest scores of the year: intelligently composed, creatively thought through and underscored with a genuine knowledge of, and love for, the genre. It's a challenging listen but not an impenetrable one. Every moment of bleakness is evened out by a moment of genuine beauty, a tapestry where compassion and ugliness sit side by side. It does what film scores are meant to do, enhancing not the visuals but the themes of the story. It's another triumph for this underrated composer and if the film is to get awards recognition, there's no reason why the score shouldn't follow suit. The score can be found as an MP3 download and will shortly be available on CD at the following links: Amazon.co.uk and Amazon.com.